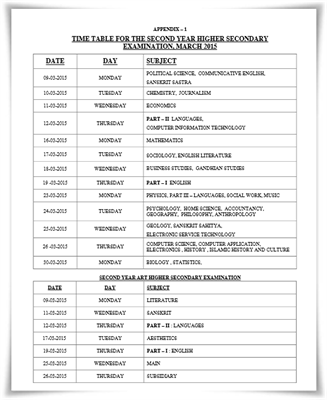 Kerala state higher secondary (DHSE) Plus Two (+2), 12th board March examination 2015 timetable has been published along with the notification at the official website. Students who are appearing for the Kerala plus two exam should download the circular to know the time schedule for the upcoming examination. The first year exam will be conducted from 9th March – 30th March 2015. The Kerala higher secondary education has published the exam calendar of the upcoming Plus Two examination to be conducted during March 2015. As per the notification issued by the department, the second year exam will be conducted from 9th March – 30th March 2015. The second year Higher Secondary Examination shall consist of Continuous Evaluation (CE), Practical Evaluation (PE) and Terminal Evaluation (TE). The practical evaluation based on the scheme and syllabus prescribed for the Higher Secondary Course will be conducted during February / March 2015. With the total combined scores of First and Second Year examinations of each subject be 200, the result will be determined by the combined scores obtained during the first and second year examinations. To become eligible for higher studies a candidate must obtain D+ grade or above in all subjects. The minimum score required for terminal evaluation for subjects with practical evaluation is 36 while for subjects without practical evaluation it will be 48. As per the exam calendar, Political Science, Communicative English or Sankrit Satra exam falls on 9th March 2015. The exam will be concluded on 30th March with Biology and Statistics. For the subjects without practicals, the exam will be conducted from 10.00 A.M to 12.45 P.M which also include 15 minutes of cool off time. The practical evaluation will be conducted from 11th February – 26th February 2015. Last date of receiving the application for Plus Two examination without fine is 30th October 2014. The details of second year candidate through DHSE Portal shall be 14th November 2014. Admission Tickets for Second Year can be downloaded from 5th February 2015. The exam fees should be remitted on time to avoid further complication. Students need to download the circular which has included details regarding the exam timetable, fees structure and other basic information. As most of the announcements are made through the DHSE web portal, it is important to keep a close eye on the daily updates.